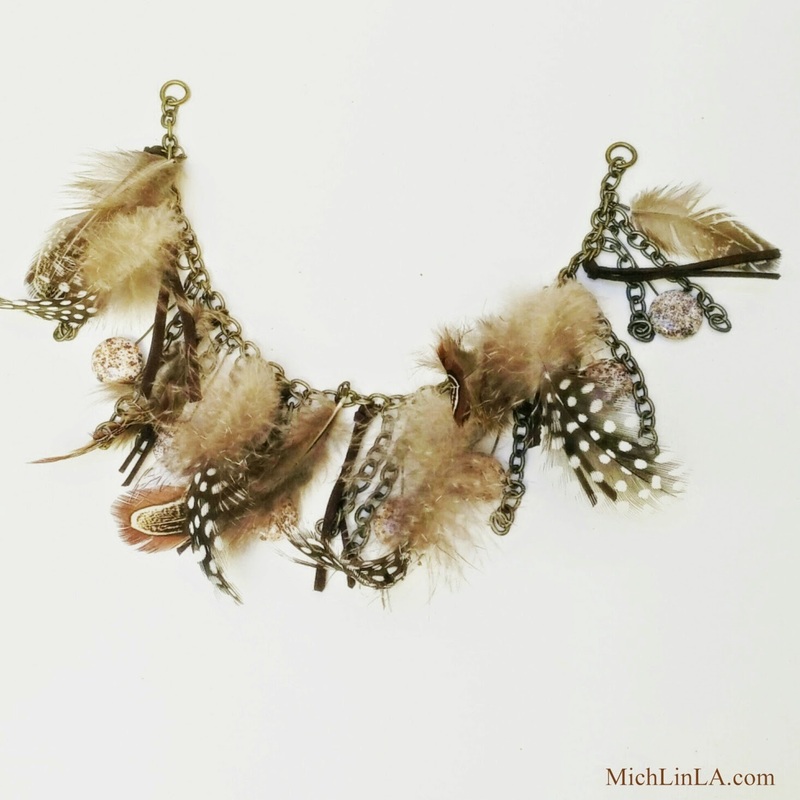 With hanging chain, suede mini tassels, and beads, of course. 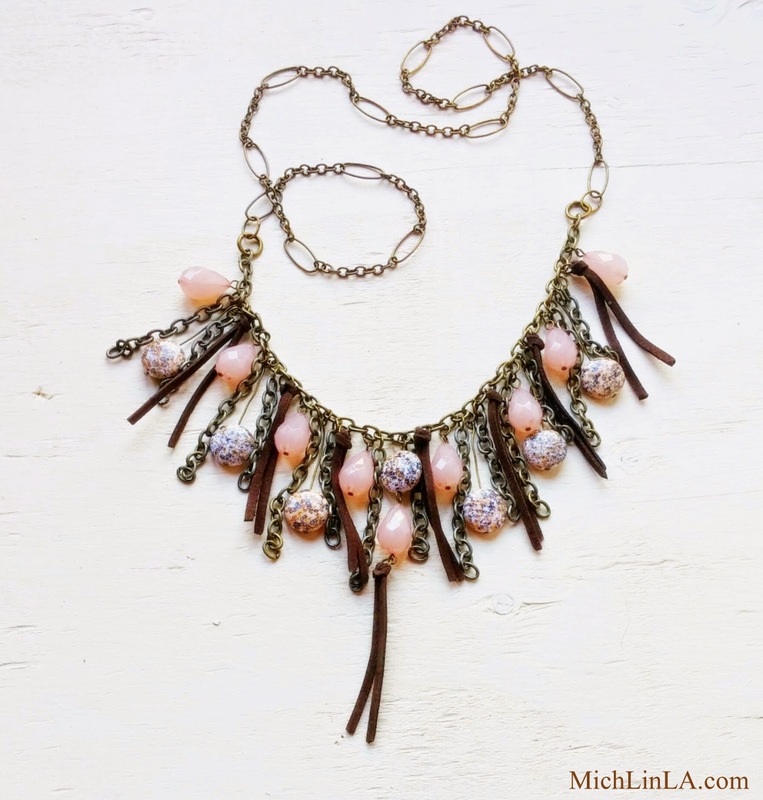 This is one of my favorite necklace styles - but they are time consuming! Allll those bits and pieces to attach - ugh. Plus the painstakingly boring counting of links to make sure everything's even. What if I told you I only spent 15 minutes on it? Since I don't see any sweat lodge ceremonies on my calendar in the near future, I embarked on a simple restyle. 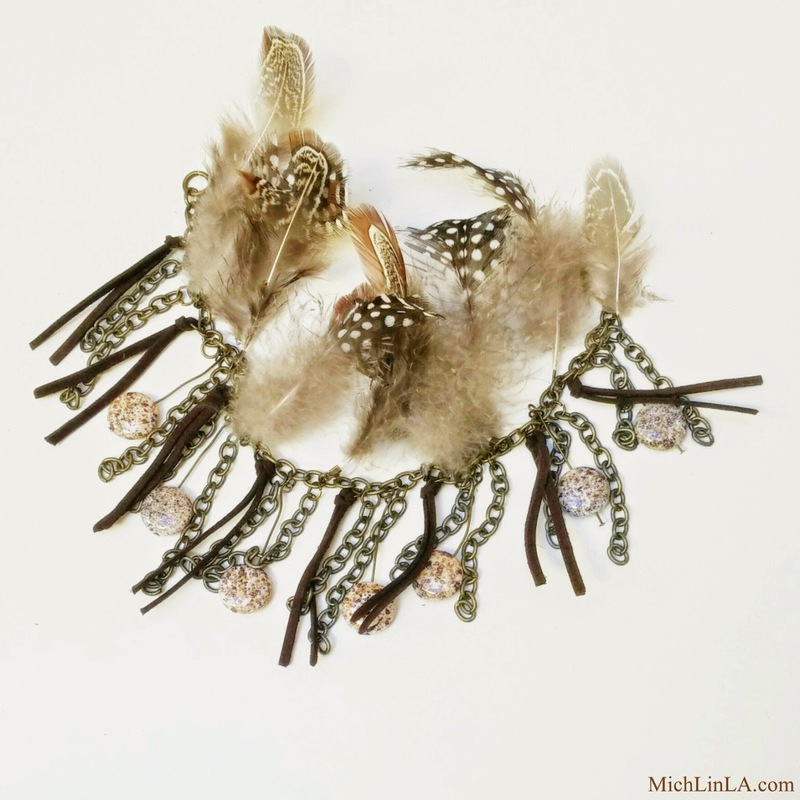 I lifted away those overpowering feathers, and decided I liked everything else on the necklace. All I did was replace the feathers with some soft rose teardrop beads (plus one extra in the middle for a focal). So quick! No counting links! The new beads went right into the slots where there used to be feathers, and voila. Isn't it interesting how much impact a small change can wreak? That's all there is to this trick. Remove one or two unlovable elements from someone else's fringe. Replace with something you love, and baby, that fringe is yours. UPDATE on the tech issue I asked for advice about: thanks soooo much to everyone suggesting a fix! I now know why it's happening. Google has added a default "auto-enhance" that dulls and darkens photos with white backgrounds, and it can't be turned off unless your blog is linked to Google Plus. Which ain't gonna happen around these parts. Several people have said to save photos as png instead of jpg. (So far, haven't gotten it to work - gonna keep trying.) A thousand thanks to all! 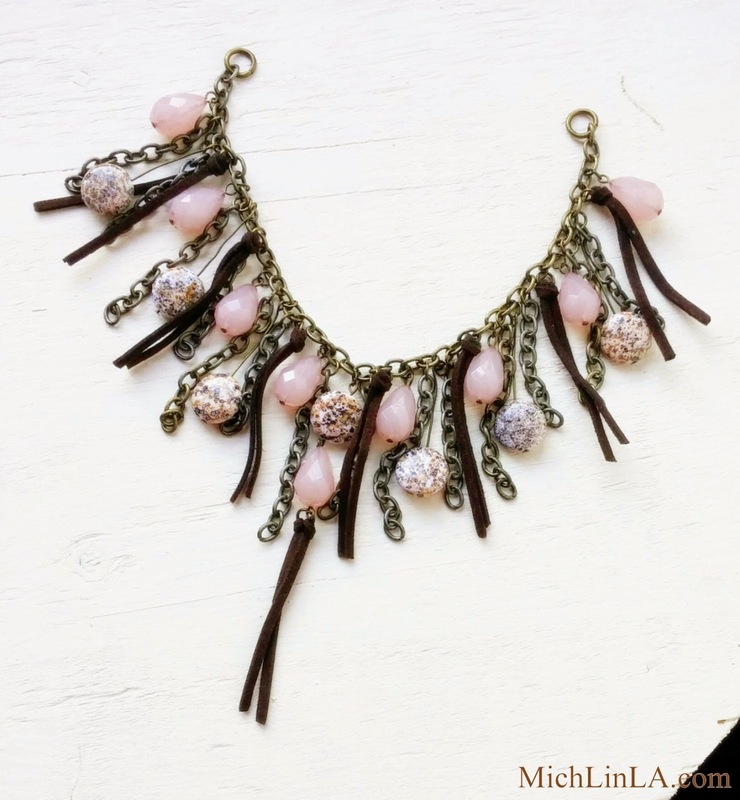 Seriously cute necklace! As for Blogger, I have no idea why it does that. My original photos look so different before I upload them. If you get that figured out, I'd love to know the answer. Love the necklace idea! Wish I had an answer to your photo issue. The "take away necklace"! I love it! I think those feathers would have been way too tickley anyway. As for the pics....I always save mine as png. But...I don't think there's anything wrong with them...they look good to me. Aren't you clever! I'm all for any method that saves time. I wish I could help you out with that annoying problem, but I must say that your pictures look fine to me from this end. Anyways.. About the photo quality..I dont think there is something weird, these are fine as usual..
Gorgeous necklace Mich! Such a difference taking away those feathers. Good luck with your photo issues, sorry I can't help with that! That is one AWESOME necklace! Nice redo!